This is Czaritsa, an Armenian Gampr dog. Bred to protect the flocks in the mountain regions. In some parts of the world, these dogs are considered a regional variation of the Caucasian Ovcharka. Yes, the ears are cropped and her tail is docked. She is not a cross, I promise you that. A very unusual dog. 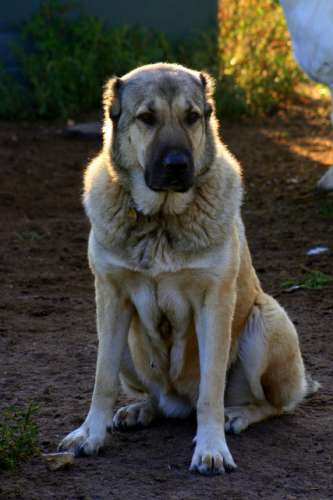 It looks like a cross between a Great Dane and a German Shephard. Are the ears cropped? The lighting around the head is lovely. Wonderful looking dog - had never heard of this breed before. What a pretty dog. She looks friendly. What a great capture of this wonderful dog. I don't think I have seen this breed before. It certainly an interesting breed.